Glorious, sunny weather for getting back into the swing of flying for the week ahead, but there are some caveats (as usual in this country). Wednesday sees high pressure pushing in from the East, which is unusual, bringing strongish Southerly winds and warm, stable air. RASP doesn’t look very encouraging, as it’s taking into account the wind speed and stability, and the fact that it’s likely to be blue. 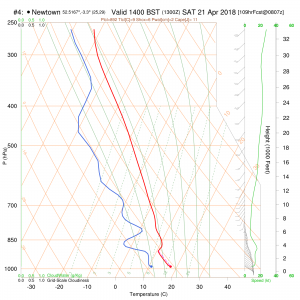 However, looking at the forecast sounding for later in the day shows quite a nice plot. I think it’ll be warm, sunny and a bit thermic with a breeze. I think there will be the odd shallow cumulus. Perfect for pre-season practice. Saturday shows a bluer picture, with some lingering weak fronts. 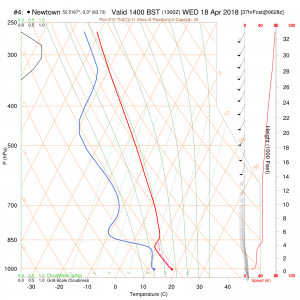 Again, the sounding shows it’s soarable, but almost certainly blue with some high cloud to contend with. Another nice day for being at the club and blowing the cobwebs (and rain) off the toys and yourself! Similar for Sunday, but the situation is so slack I’m not sure if anyone really knows what’s happening for sure. I’m out of the country at the weekend, so you will have to let me know if I was right!